An Art gallery is a place which has a large collection of paintings. 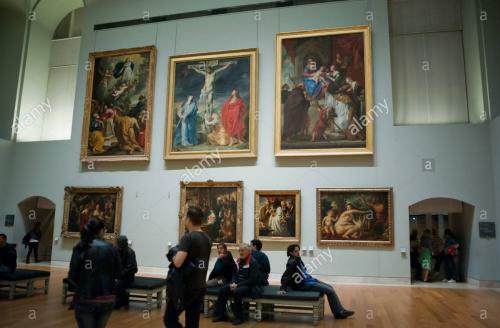 This art gallery I am referring to here is one with a lot of paintings on the mythical events from the life of Jesus Christ. The paintings are of different sizes and the medium of paint is Oil. The paintings displayed on the wall are a bit old fashioned and there are a few people sitting on a bench and admiring the paintings. The paintings are so realistic that they can take you back in time. The emotions on each characters’ face can be clearly seen and felt by the viewer. One lady is researching the displayed paintings for a project. Paintings always take you to a happy world, where you can relax and calm your nerves. These paintings also give inspiration to the modern artists to paint realistic paintings than modern ones.